Once more, I greeted the day with no fever and nothing wrong beyond a very slight soreness in my throat. I didn't take any chances, though-- I dressed as warmly as possible for the early-morning passage through the Qutang Gorge. Since the early-morning humidity fogged up every glass surface in my camera, including some of the internal lenses, I got no pictures at all. This is profoundly tragic, for Qutang Gorge was by far the most spectacular of the three. Only 8km long, it look as though it was created by splitting a very large mountain right through its center, with the split bending about twenty degrees in the middle. There were sheer cliffs on a scale I could not have imagined, dwarfing what we'd seen the previous day on the Daning River. Once peak seemed to almost literally overhang the river, it was so close and high. Even after we'd passed beyond the gorge, looking back, it was hard to believe that there was room for a river amongst all those peaks. Shrouded in layers of mist and backlit by the sun, the gorge was a breathtakingly beautiful sight. I would have given much for a functional camera just then. There were the cliffs in the foreground, haze-obscured, and peaks above them, further obscured-- then a layer of cloud, glowing white in the sun, ragged and wild-- and above that, faint but still very powerful, a perfect half-dome peak, curving up to a point and then dropping straight down into the clouds. After that, the rest of the day was anticlimactic, but there were some points of interest. We saw a demonstration of traditional Chinese painting, which looked much easier than I'm sure it must be. Kat commissioned a couple of pieces-- a cat-and-cricket and one of a breastfeeding woman (my suggestion). We napped for most of the afternoon and generally relaxed. Late in the afternoon, we passed a temple of some note, so we went up on deck to see it (and take pictures, of course). 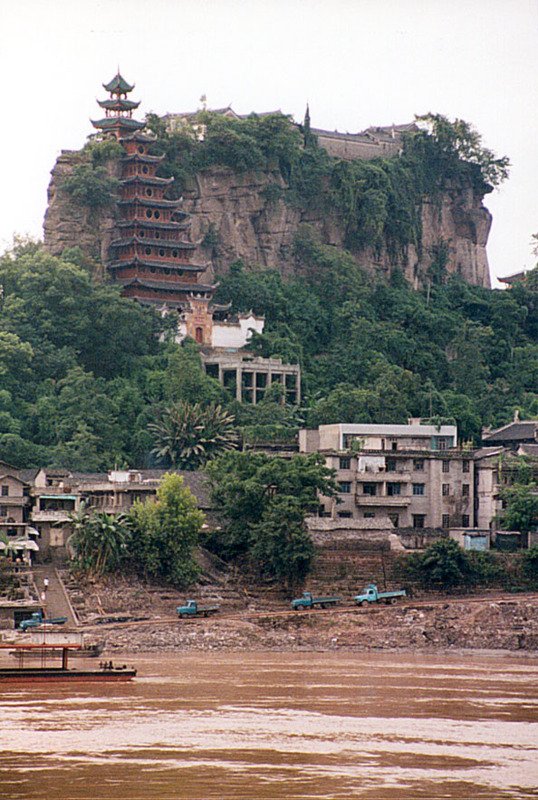 The temple is built upon a column of rock, and the stairway to it is built right up the side of the stone tower. It's remarkable in its construction, looming as it does over the small town below. It's also remarkable because while the town is doomed, and everything up to the base of the tower will be underwater when the Dam is completed, the column itself will be above the water-- and so the temple will survive. As we passed by, we got to see it from two sides, and it was quite amazing. It was even more amazing to realize that it would be an island in about a decade. While on deck, once the temple was out of sight, I finally got a good picture of Kat with the Yangtze behind her. I'd have done it sooner, of course, but being stuck in our cabin for half the trip really put a cramp in my style. Dinner was special in that it was the first time on board that I'd attended dinner and been hungry at the same time. Fortunately, everything was very good. Afterward, Kat went to the "Crew Cabaret" while I retired to the cabin to rest and catch up on my journal-writing. As for news on the health front: Brenda is well again, but Sy has gotten pretty sick, and we're heard that the virus is now spreading through the crew. If I don't watch out, I'm going to get a reputation as "Typhoid Eric." As for me, I still have a mild sore throat and a lingering cough, but no fever, and I feel pretty good. We'll see if it holds up. Tomorrow, an unexpected and welcome change of itinerary: we will visit Fengdu!